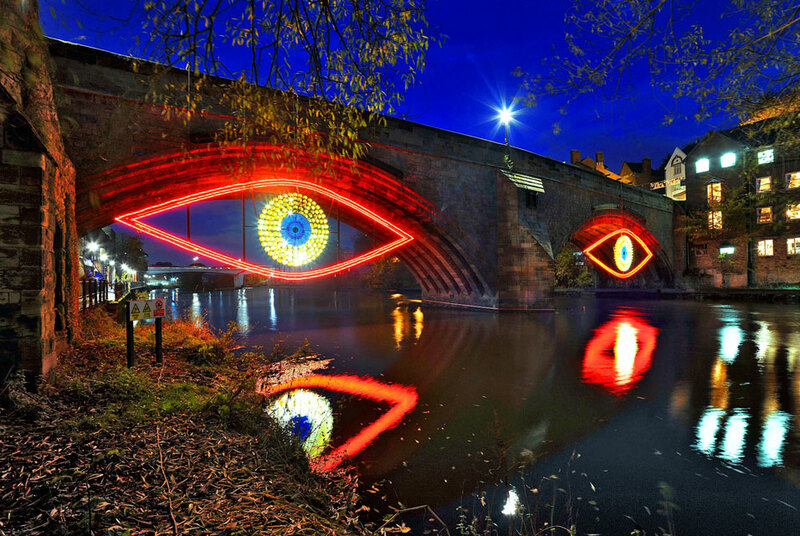 Eye, an installation from Enlightenment. DURHAM.- A UNESCO World Heritage Site; home to stunning ancient architecture in the form of its Cathedral and University; host to renowned art events and festivals including an international literary festival, a two-week brass music gathering and a cutting edge festival of light, owner of the largest collection of decorative art outside of London and location to one of the most popular visitor attractions in the UK, tomorrow Durham will take part in a nationwide seminar to continue its bid to be UK City of Culture in 2013. Durhams culture is rooted in spirituality, knowledge and sense of place and its bid centres on three strands; Creative Durham a series of activities designed to grow the countys cultural life, encourage community participation in cultural activities and promote Durham as an area where creative individuals can live and work; Festival Durham, an ambitious series of events and festivals which will take Durham into the next decade, cementing its position as a true cultural destination and Cultural City, Cultural County, a series of activities which seek to reconnect the communities of the county with their capital, and vice-versa, re-energising the city as the economic, social and creative heart of the county. Paul Gudgin, former director of the Edinburgh Fringe Festival is also supporting the bid, giving guidance as a creative consultant. He helped transform the Edinburgh Fringe into one of the worlds best breeding grounds for comic, music and theatrical talent. Gudgin first became involved with Durham when he advised on the development of Brass: Durham International Festival. Glasgow and Liverpool represented attempts to revitalise large, post-industrial cities through culture. We have the opportunity to show that awarding UK City of Culture to Durham will represent a real contrast to the two European versions hosted to date. Durham is a romantic and striking city with compactness, historic beauty and opportunities to stage outstanding festivals and events. It is the perfect canvas upon which the city and county of Durham can make a major contribution to the nations cultural life, said Gudgin. Local support for the bid is also strong with over 4,000 people publicly pledging their support in just over a month. People of Durham have always known how wonderful their city and county is and they want to show this to the rest of the country and the world. Residents were offered the chance to back the bid when officials from Durhams culture bid officially unveiled the logo and branding to be used. Exhibited in a community art gallery in Durhams city centre the show pulled in enthusiastic crowds who pledged their support by signing their names on the walls of the gallery. Empty Shop will now go on tour around the region throughout autumn so as many people from the area can show their support.  Durhams Cathedral is one of two UNESCO world heritage listed Cathedrals in the UK and is considered to be one of the best examples of Gothic architecture in the world. From early history onwards the city and county has always attracted the brightest creative minds and is the cultural heart of the city and the county.  Producers of extraordinary live events Artichoke, renowned for La Machine, the Sultans Elephant and Antony Gormleys Fourth Plinth commission One & Other will produce an ambitious and spectacular festival of light, Lumiere, in the city, building on last years Enlightenment Festival which attracted 30,000 visitors.  The Durham Book Festival is one of the cultural highlights of the year, playing host to authors from around the world. This years festival sees books coming to life with author events happening in site specific locations. Victorian train detective writer Andrew Martin will hold an event at a restored Victorian train station in the village of Stanhope and the Norths Biggest Book Swap will take place right in the heart of Durhams city centre.  BRASS: Durham International Festival is an annual two-week festival of world brass music drawing artists from across the globe and audiences of over 80,000 each year.  The award-winning Beamish Museum celebrating life in the North East in the 19th and 20th centuries and Locomotion: National Railway Museum telling the story of County Durham as the cradle of the railways are among the most popular attractions in the North East.  The Bowes Museum a French style chateau that houses one of the largest collections of Decorative Art outside of London, built by 18th century art collector John Bowes for his wife.  The Gala Theatre, Durhams leading arts venue that produces new work, nurtures home grown writers, as well as attracting national productions and companies. The Arts Council England estimates that the Gala Theatre contributes £6.5m per annum to the local economy.  Durhams excellent sporting offering also strengthens its bid with the Durham Regatta, dubbed the Henley of the North the second oldest rowing regatta in England draws crews and major crowds for two days every June. Durham County Cricket Club has grown from gaining first class status in 1991 to winning last years English County Championship, and will host The Ashes in 2013 acting as an international test cricket venue until 2016. Aiming to inspire people across County Durham and transform the economic prospects of this rural region, Durhams bid aims to encourage people and communities to aspire and be inspired. By re-energising culture it seeks to reverse the trend which places Durham low on the league table of English counties for people visiting libraries and museums and attending cultural events. The economic and social benefits to Durham are clear, winning the bid to be UK City of Culture would mean developing a creative place for people to work and live. As well as the pleasure of simply enjoying culture and encouraging residents of the county and the city alike to express themselves and their communities through culture, cultural regeneration has shown to improve an areas economy, its residents health and wellbeing, the level of education offered and general quality of life. Culture, tourism, sport and recreation businesses and creative industries employ nearly 10% of the regions workforce, and contribute over £1bn per year to the regional economy. However, if the region is to emerge from the economic downturn in a stronger, more competitive position, there is a need to create quality places where people want to live, work and do businesses by finding new and imaginative ways of using culture. Re-stating Durhams importance as a cultural centre will develop pride and aspiration in the county.